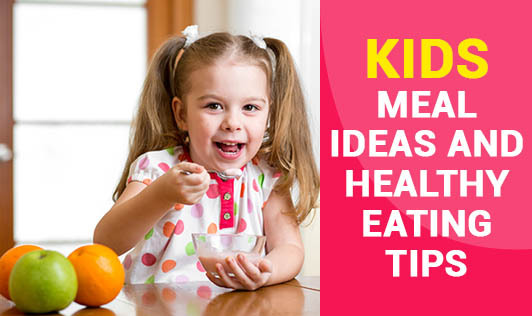 Every parent has the same question - how do you get your kids to eat healthy? If you want kids to be interested in healthy eating, you need to make foods fun and creative. There are several ways to make food appealing and encourage kids to eat. • Introduce children to a wide variety of foods with different textures, flavors etc. The more the variety of good food, the better the chance for them to get the right vitamins and minerals essential to growing children. • Eat together as a family.This does wonders to a kids' healthy eating habits. • Make food appealing: A variety of colors can get a kid's attention going. So make sure you have a colorful food plate that will look appetizing and they will be more interested in eating it. • Mix and Match: Create ways to get kids to eat fruits and vegetables. If your kid is a fussy eater, try cutting fruits and vegetables into different shapes and sizes before you serve them. Incorporate greens and a variety of veggies into their favorite foods, so they get accustomed to them. • Choose a new food item to try weekly. This is an excellent way to widen the number of foods that your child will eat. Make it a family outing to the grocery store, and let your children pick something new to try that week. • Cut back on food choices from non-nutritive sources. Watch out for high calories from foods such as chips and other deep fried foods. • Make healthy substitutions: Replace fruits or honey for sugary products. • Lead by example: If you want to serve you kids healthy meals, practice healthy eating in front of your children. If you are eating your vegetables, your child will most likely learn to eat vegetables. No matter what you choose, try and keep the recipe simple. Doing something as simple as allowing kids to cook with you will also help in improving their healthy eating habits.